I gotta tell you, I generally do not like French films. No sir, I generally do not find them entertaining. 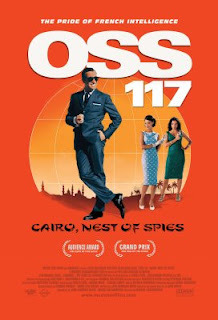 That said, OSS 117 Cairo, Den of Spies is so funny that it transcends any cultural differences. This movie is a spoof of 1960’s spy movies and is based on a series of books by Frech author Jean Bruce. The main character, Hubert Bonisseur de La Bath, is a chauvinistic, culturally insensitive French Spy (though in the original books, he is an American Colonel), portrayed by Jean Dujardin who does a masterful job delivering the laughs. Taking place shortly after the deposing of Egypt`s Kink Farouk by the government of Nassar, La Bath is sent to find out what has happened to fellow agent (and apparently very good friend), Jack Jefferson and a Soviet cargo ship full of arms, the Karpov. La Bath has two love interests in the film, one being assistant of Jack Jefferson, Larmina El Akmar Betouche and daughter of deposed King Farouk, princess Al Tarouk who has difficulty resisting La Bath’s advances. La Bath proves to be an obtuse, silly, chauvinistic and completely culturally insensitive jerk, who on multiple occasions belittles the Islamic faith (mainly because he just does not understand it), and minimizes the role of woman continuously. His ignorance leads to ridiculous consequences (almost fuelling a revolution by his stifling a Muezzin, the person who calls (sings) the call to prayer, because he disturbed his sleep. This movie is a hilarious romp and I strongly suggest you watch it. Just a heads up – don’t watch it if you don’t like subtitles. This entry was posted on September 7, 2012 by catfishman. It was filed under Uncategorized and was tagged with 1960s, Cairo, classic, comedy, Egypt, espionage, Farouk, France, French, funny, Hubert Bonisseur de La Bath, James Bond, Jean Dujardin, Nassar, OSS117, silly, spies, spy, subtitles.